In an unexpected continuation of my last post, this weekend was another learning experience for me. It was hilarious and I can just picture how ridiculous I must have looked then. But, it is a story that beckons to be told I think. 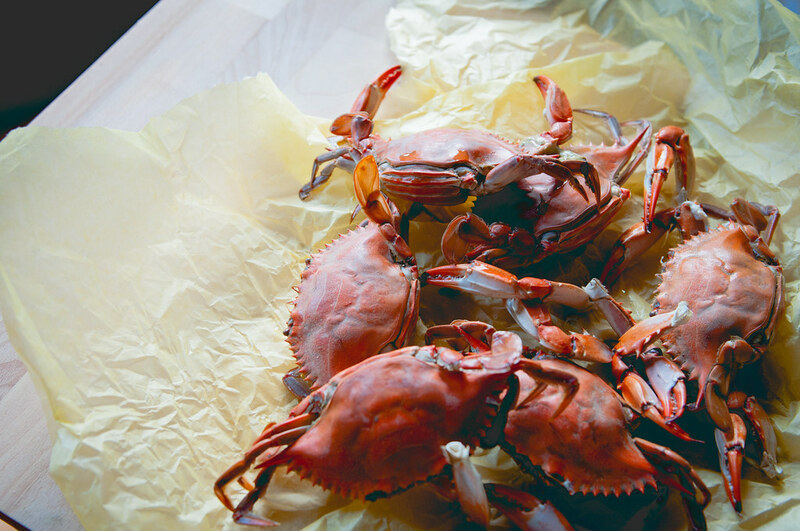 These crabs deserve to be spoken for. from Simone) at very affordable prices. 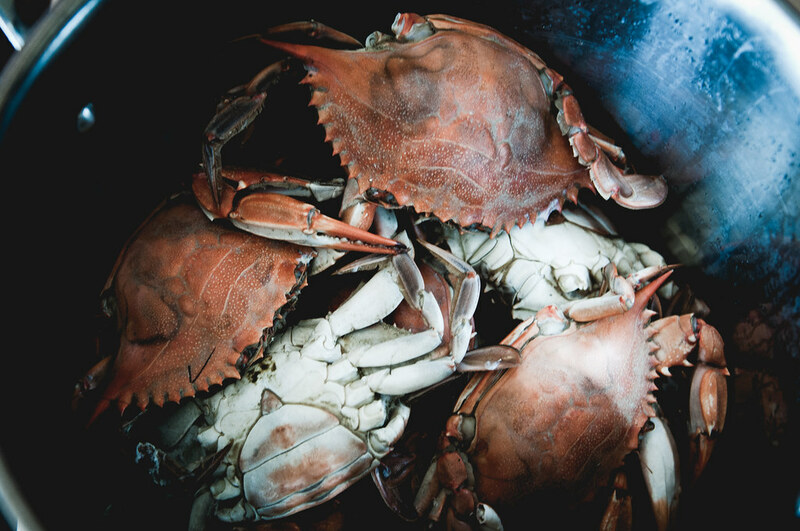 Sparkling fish eyes, glistening gills and live crabs, all in the confines of the city. The only thing I recommend is getting there early in Summer before the heat does what it usually does. Anyway, I went there with the specific goal of getting live crabs, which, are in season now, to make my awesome Crab Curry, one of my signature heritage dishes. I got them. Six nice ones that looked docile enough when the fish guy packed it in a paper bag. In the 40 minutes it took me to get back home, I don't know what else happened but the bag had gotten a touch soggy. Hold a minute: Why did I get have live crabs? That is the crux of the story, isn't it? Well, the fact is you NEVER buy dead shellfish. NEVER, especially not if they are on sale! The problem with shell fish, and possibly the reason I suspect some religions prohibit eating them, is that when they die, the body waste remains trapped within the shell casing. Looking from outside, you don't know how much the flesh has rotted within. So, you buy them live and kicking, so at least you know they have fair breath in them. So, now that I am all set with what I wanted to cook, the first thing to do is to, ahem, 'truss' the crabs. That is to say, kill them. The fastest and, I hold, most humane, way of doing that is immersing in hot boiling water, any liquid actually (like crab boils). They die in seconds and the boiling liquid also helps in sterilizing. Now, here the adventure begins. As I was tipping the paper bag into the pot, the soggy bottom literally split on me, spilling the crabs on the kitchen floor by my foot. Ok, I am not proud of what happened next. But, it is important to get it out, I have told. Well, I squealed. Like a little girl. None of that suaveness of a refined cook or just a mature woman. Nope. Just a 5 year old's ear piercing scream as I hopped about, running away from the damn creatures while trying to not step on them for fear of either crushing them or being snapped by their pincers. A moment later, I was far away from them but there were crabs on the floor. To the rescue came the man. Thank God! In momentary sanity, I grabbed a pair of tongs and promptly handed it over to him, with a beseeching look. 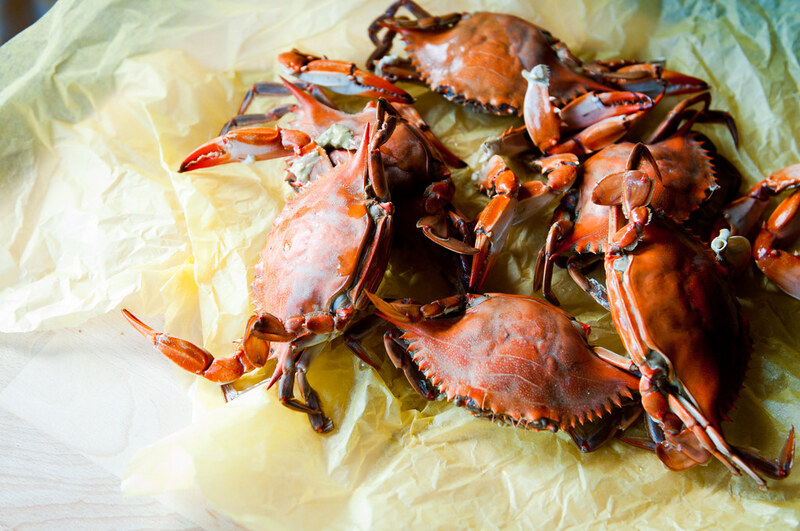 The crabs had by this time formed themselves into a wide triangle configuration. Seriously, it was amazing to watch. The corner point was clearly the leader. One of them even turned over and showed its belly. You would think that one would be easy to pick up? Oh no! If you made a move to that one, the leader came scrambling to attack. So, the thing, you had to fight that one. What a valiant general she was (all my crabs were female as it turned out)! She stood on her hind 4 legs, with her pincers warningly raised in a hover, quick to snap at anything moving within reach, eyes popping out of the socket and very wary of the surrounding and the man with the tongs. Have you ever paid attention to a crab's eyes? I had the opportunity to observe them deeply for a full 5 minutes! Five minutes. That is how long the fencing match of wits lasted between man and crab. One crab. Finally, we twigged that picking her up by one pincer than aiming for the square middle was more effective. Quickly grabbed she was dropped into the pot whence the water was still boiling. Even though the leader had fallen, the rest still put up a strong fight, including scurrying away out of reach beneath the pantry shelves. More support in the form of the swifter sweeper was needed to drag that one into submission. All in all it was a good 15 minute effort, helpfully enabled with me squealing behind the scenes and fetching the props when I managed to gather the wits about. Then came the next part of cleaning and cooking them into an awesome tangy sauce made with fresh tomatoes, fresh spice paste and freshly grated coconut. A few hours of simmering and resting later, the feisty little buggers were consumed with full relish and with awareness of the effort that went into making of the dish. I still recall the fighting spirit of the pack leader vividly. There was a spirit. She was alive. And wanted to be. RESPECT! So, my take away. It is larger than this single incident but really serves to bring a bigger perspective of eating animals into focus. To wit, no creature WANTS to die. The idea of happy animals is a myth and marketing gimmick. Whether raised on land, pasture, feedlot, sea or a tank, every creature wants to survive, and, procreate if it can. Even animals that we usually don't consider as much as being fighters would really, really to go on living and not find its way into the belly of a bigger creature. That is the way of nature and the way we see fairly often in the wild. So, the hype that a farm animal is any more happy to be slaughtered and hence tastes better is WRONG. I have seen goats sense their time and resist piteously being dragged to the altar. If you have seen a stubborn dog refusing to move, imagine 10 times more, accompanied with bleating pleas. To argument to eat pasture-raised meat is not about happiness at the altar but prior to it. The argument is solely that the animal has been treated with respect and allowed to have a happy life of natural inclination. To focus on the reality of nature rather than arbitrary and romanticized notions of life. I have a longer story on corn versus pasture in connection with my research of the beef industry. But, the above tenet applies to that larger discussion as well. The focus on how rather what is paramount. With that I leave you with the recipe for that wonderful curry with attitude I made and I think it pays apt homage to the lives of the crabs we fought. To get the best flavor, it is important to make this dish out of the fresh ingredients. As often in nature and Indian cuisine, that works harmoniously because, crabs are in season at the same time the rest of the ingredients are! Grind together the onion, ginger and garlic into a puree. Heat two tablespoons of oil and roast the whole spices till they pop, then add the urad dal, fennel seeds and dry chillies. Take care to not over roast the fennel seeds as they tend to emit a bitter taste to the whole curry. Saute the onion paste along with ginger and garlic till the raw smell goes away. Then add the dry spice and salt to taste. Roast for a couple of minutes to cook the spices. Add the fresh tomato puree and tomato paste and 1 cup water/stock and cook till the tomato is cooked. Stir in the coconut milk and grated coconut and another cup of water and let the gravy come to a light boil on medium heat. Set the heat to low and then add the juice of the tamarind and bring back to rolling boil on medium. Turn heat low to simmer and add the crabs. Cook on low to medium for another 20-25 minutes till the crabs are fully done. 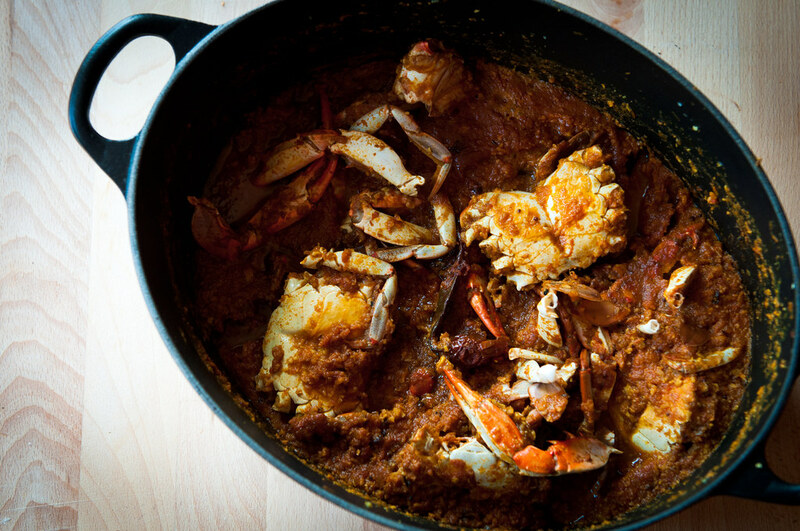 Let the gravy sit for atleast 2 hours so the crab meat absorbs the flavor of the curry. It is best when eaten the next day! Serve with hot rice cooked a couple of cloves and piece of cardamom.